Need to send SMS from your computer? Instead of using SMS software, you can send SMS via your web browser with the web-based SMS gateway, Voodoo SMS. Our platform lets you send text messages online without having to download or install any SMS software on your computer. You can send and receive messages in any quantity from your web browser at some of the most competitive rates in the UK. From bulk text message marketing to SMS notifications, alerts and account confirmations, our powerful online SMS software lets your business contact its target audience, customers, users and stakeholders using SMS with great delivery rates and excellent pricing. Create your account now to get started or continue reading to learn more about how our online SMS platform works. 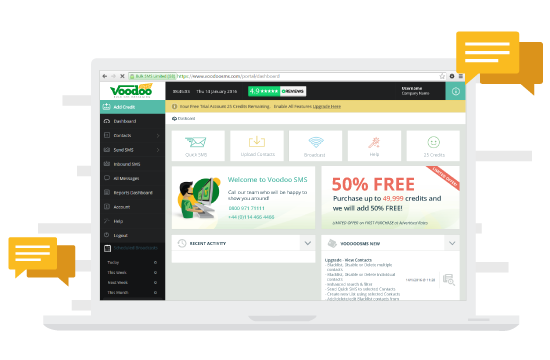 Voodoo SMS is an online SMS gateway that lets you send and receive SMS from your browser. It works similarly to SMS software. However, with Voodoo SMS there’s no need to download or install any third party software on your computer, preventing you from security risks and helping you avoid the costly fees many desktop SMS applications charge. Instead of purchasing and installing software to start sending SMS, all you need to do is create your free Voodoo SMS account and launch your campaign. There’s no need to search for SMS software for Windows, Mac OS X or any desktop operating system. There’s no need to purchase a license before you start sending. Our easy-to-use SMS platform is accessible as soon as you create and fund your account. Voodoo SMS is built to meet the needs of bulk SMS marketers. Our volume-based pricing lets you spend less for each message the more SMS you send, down to a cost of just 1.74p for each message we deliver. We have no minimum order quantity, allowing you to fund your account for just one message or for high-volume SMS messaging. Start your SMS campaign now at a fraction of the cost of SMS software for PC. Using Voodoo SMS, you can send and receive SMS online from your account. Your messages are delivered from our SMS gateway to your contact list, letting you target existing customers or interested opt-in prospects with ease. Thanks to our full support for dynamic SMS, it’s easy to customise your message to include a voucher code or other incentive to increase your response rate. When you receive a response SMS, you can import the recipient’s phone number into a new list for remarketing. Our SMS API makes it easy to integrate Voodoo SMS with your application. Use our platform to deliver order confirmations, account security messages, helpful notifications and alerts direct to your target audience via SMS. Automate your sales system so that CRM entries automatically receive text messages after a specific event. Our SMS API offers functionality far beyond most desktop SMS software, giving you the power you need to ensure your SMS marketing campaign is a success. If you’re searching for a cost effective, powerful alternative to desktop SMS software, we’re here to help. Create your Voodoo SMS account now to start your first SMS messaging campaign at a fraction of the cost of traditional Windows SMS software.